Mon-Fri Stamford Hill allocation introduced. Sunday Stamford Hill allocation withdrawn. Sunday Stamford Hill allocation re-introduced. Peak journeys introduced to Flamstead End. Withdrawn north of Ponders End. Extended from Edmonton to Ponders End at all times. Routemaster coach type replaced by normal Routemaster type. Edmonton garage closure - reallocations as above. Tottenham (AR) allocation transferred to Enfield (E). Withdrawn between Liverpool Street and Waterloo except for early morning journeys to Mansion House Stn. Re-instated between Liverpool Street and Waterloo albeit peak hours only after local objections. Mon-Fri Tottenham (AR) allocation introduced and Stamford Hill (SF) withdrawn. Early morning journeys to Mansion House withdrawn. 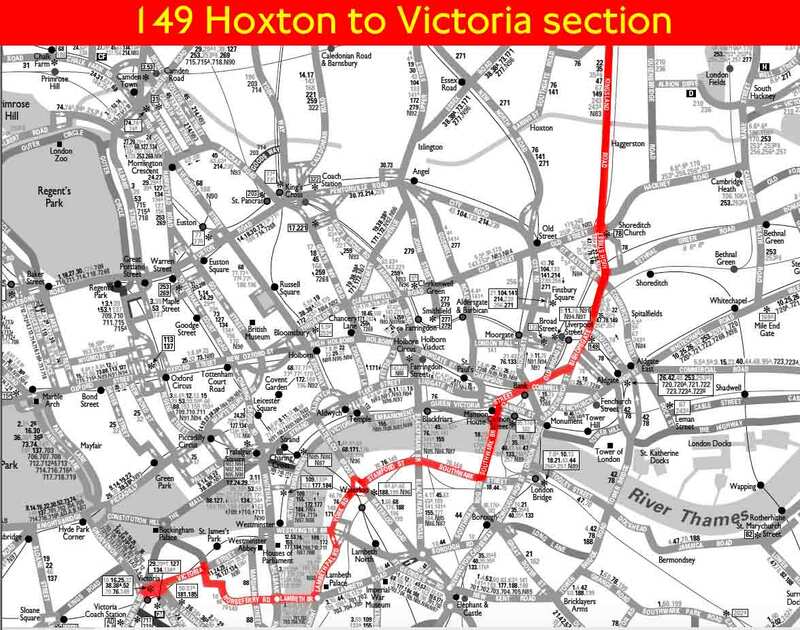 WATERLOO - SHOREDITCH peak journeys only withdrawn plus AR allocation replaced by rerouteing Route 344. The MA's are all kept at Edmonton (EC) but the schedules are worked by both EC and SF crews - with crew ferry vans used as required. Changeover point at garage or Ponders End High Street. Changeover point at Tramway Avenue / Hertford Road. Changeover point at TOTTENHAM Swan. Changeover point at Stamford Hill.